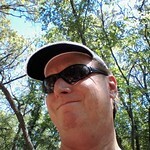 During our recent outing to Eureka Springs Heather and I visited Thorncrown Chapel. Architect E. Fay Jones little jewel in woods. It may be the most remarkable structure I have been in. It is so full of light and is light and airy. I I don’t see how it even keeps itself supported. 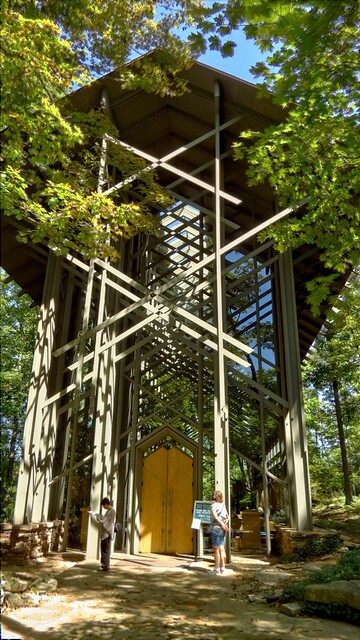 The structure is built entirely out of wood, glass, and stone. You can read more about it and see some spectacular photographs on Thorncrown’s Website. The chapel gets lots of visitors but everybody is very quiet inside the building plus they quite politely and calmly ask people to sit down while they are looking around and taking photographs. I loved how the design is kept open by the absence of an altar. Note though the cross standing outside the structure and the rock ledge looks like an altar to me. 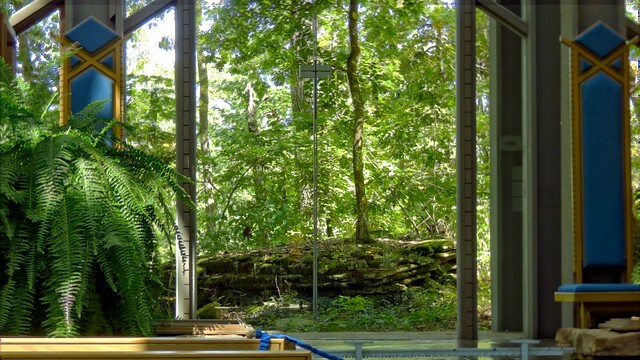 The chapel fits in perfectly with its surroundings. Jones specified that no single component could be bigger than what two men could carry through the woods to the site. The trusses and such were built on site the lumber that was carried to it. I guess that I am turning into a fan of E. Fay Jones. 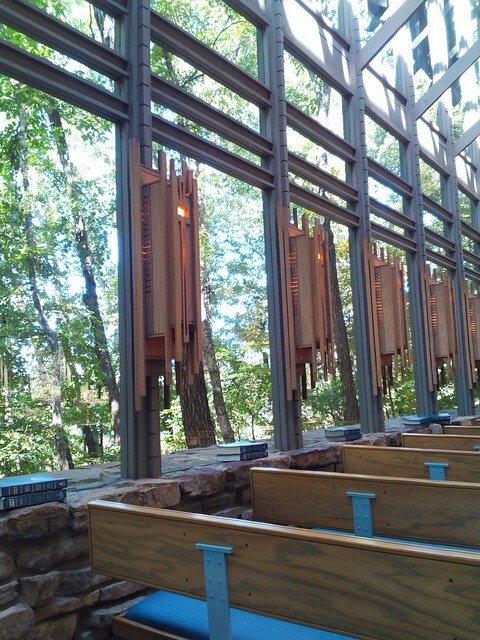 Just a year ago I visited his Marjorie Powell Allen Chapel at Powell Gardens near Kansas City, Missouri. It was another structure that blew me away. Google has built a 3D model of the building. You have to play around with a little bit. It gives a better idea of what it looks like in its setting. 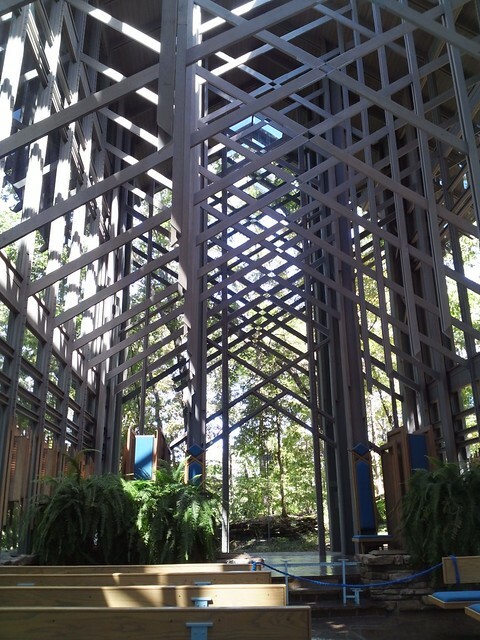 This entry was posted in Architecture and tagged Architect, Architecture, Arkansas, Chapels, Churches, Eureka Springs Arkansas on September 23, 2014 by Alan Bates. What a delightful, different chapel, and your captures are superb!! I do love all of that green!! Thank you for sharing!! Hope your week is going well!! 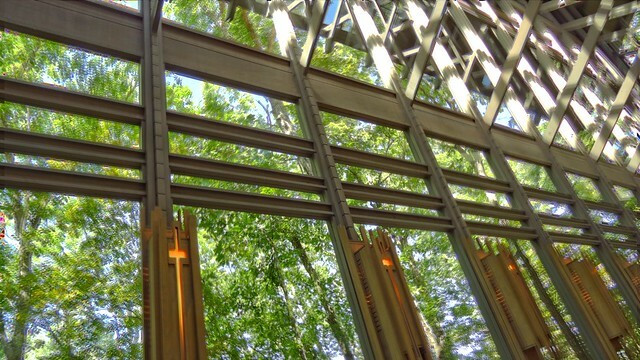 The next time you’re in Bentonville to visit Crystal Bridges, drive out to Bella Vista (about 10 miles) and visit the Mildred Cooper Chapel. It is an E. Fay Jones design with a very similar footprint as Thorncrown. However, it is executed in steel and is indeed more Gothic in design. By the way Crystal Bridges now has an exhibit of sketches and models by the architect that designed the museum. It is a great exhibit. Have a great week. Enjoy the fair. We went through Bentonville on our way back and had planned to stop at Crystal Bridges but we decided to just get on home. 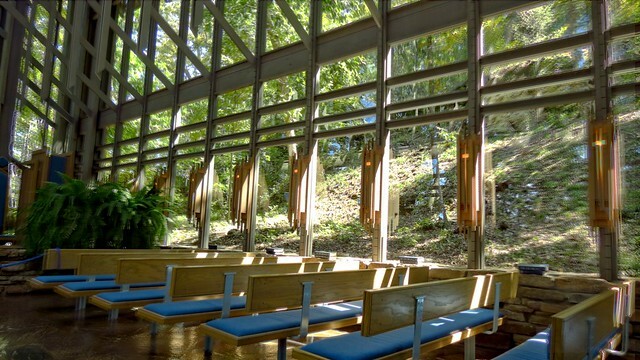 We are definitely going to check out the Mildred Cooper Chapel next time we are in the area. So beautiful and unique! I’ve got to add it to my bucket list.